Muscle sarcomere in the relaxed (left) and contracted (right) states. Titin (right) is shown in yellow, actin in blue, and myosin in red. Titin is the largest protein chain in your body, with more than 34,000 amino acids. This titanic protein acts like a big rubber band in our muscles. It is attached at one end to the Z-disk (shown here at the top in blue), which organizes the thin actin filaments. The other end of titin is attached to the M-line (shown in red at the bottom), which organizes the thicker myosin filaments. In between, titin (shown in yellow) has a number of elastic elements that stretch and contract, holding the whole contractile apparatus in the proper shape as the muscle flexes. The long titin chain folds into a series of several hundred modular domains. Most of these domains are similar to the domains that make up antibodies. PDB entry 2rik includes three of these Ig-like domains. Fibronectin-like domains are also included, particularly in the portion that interacts with the myosin filament. PDB entry 3lpw includes two of these FnIII-like domains. Titin also includes several specialized sequences. A repeated sequence that is rich in proline amino acids, the PEVK region, forms a disordered segment near the center, and a pseudokinase domain is found near the end of the chain (shown here from PDB entry 1tki ). Titin specializes in elasticity. The stretching of titin occurs in several steps. The day-to-day stretching happens when all the little hinges between the Ig-like domains straighten out. At higher tensions, the PEVK region at the center stretches and then collapses back into a tangle when the force is released. With even more tension, the individual domains unravel, but this is not currently thought to happen in the normal range of motion of muscles. Telethonin (red) bound to the ends of two molecules of titin (yellow). Titin interacts with dozens of other proteins to form the structure of the sarcomere and regulate its action. 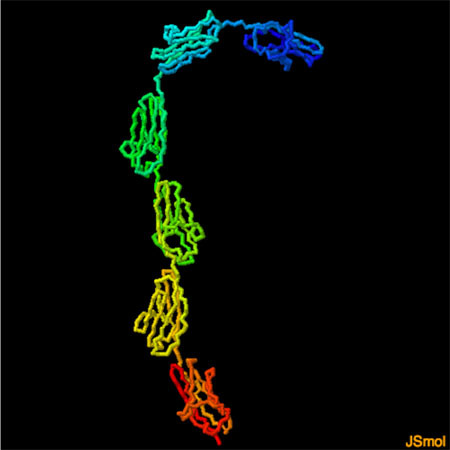 The one shown here is telethonin, shown in red from PDB entry 1ya5 . It glues together the first two Ig-like domains in two neighboring titin molecules. Other titin partners found in the PDB (at least in part) include obscurin, another long modular protein that forms a connection to membranes, alpha-actinin, which forms the structure of the Z-disk, and myomesin, which forms the structure of the M-line. The individual domains in titin are connected by short, flexible linkers, giving the whole structure the look of beads on a string. PDB entry 3b43 includes a short segment with six Ig domains. The curvy shape of the structure gives some idea of the flexibility of the titin chain. To explore this structure in more detail, click on the image for an interactive JSmol. You can look at the Protein Feature View for human titin to get an idea of the size of the protein, and the portions that are included in the PDB archive. Many flexible proteins are constructed from tandem repeats of modular protein domains, although not as many as is found in titin. Try, for instance, searching for structures in the PDB for immunoglobulins, fibronectin, and cadherin. W. A. Linke & N. Hamdani (2014) Gigantic business: Titin properties and function through thick and thin. Circulation Research 114, 1052-1068. 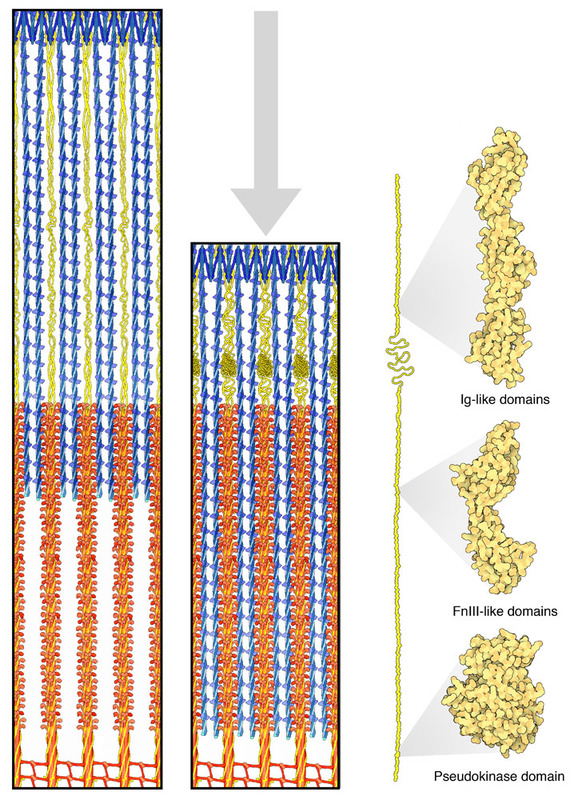 L. C. Meyer & N. T. Wright (2013) Structure of giant muscle proteins. Frontiers in Physiology 4, 368. 3lpw: R. M. Bucher, D. I. Svergun, C. Muhle-Goll & O. Mayans (2010) The structure of the FnIII tandem A77-A78 points to a periodically conserved architecture in the myosin-binding region of titin. Journal of Molecular Biology 401, 843-853. 3b43, 2rik: E. von Castelmur, M. Marino, D. I. Svergun, L. Kreplak, Z. Ucurum-Fotiadis, P. V. Konarev, A. Urzhumtsev, D. Labeit, S. Labeit & O. Mayans (2008) A regular pattern of Ig super-motifs defines segmental flexibility as the elastic mechanism of the titin chain. Proceedings of the National Academy of Science USA 105, 1186-1191. 1ya5: P. Zou, N. Pinotsis, S. Lange, Y. H. Song, A. Popov, I. Mavridis, O. M. Mayans, M. Gautel & M. Wilmanns (2006) Palindromic assembly of the giant muscle protein titin in the sarcomeric Z-disk. Nature 439, 229-233. 1tki: O. Mayans, P. F. van der Ven, M. Wilm, A. Mues, P. Young, D. O. Furst, M. Wilmanns & M. Gautel (1998) Structure basis of the activation of the titin kinase during myofibrillogenesis. Nature 395, 863-869.